Since at least 1940, the National Electrical Code has contained a requirement for ampacity correction of installations subject to high temperature conditions. In the 2005 NEC, a new fine print note was added to inform code users that if conductors in conduit were exposed to direct sunlight in close proximity to rooftops, they might experience an additional 30°C temperature rise above ambient (NEC-2005, 310.10 FPN 2). New code language was added in the 2008 Code in 310.15(B)(2)(c), and a new Table 310.15(B)(2)(c) to address rooftop wiring installations. With these additions to the Code, it now is a requirement to apply additional corrections to conduits exposed to sunlight on rooftops. In effect, this has redefined the ambient temperature requirements for these locations. Ambient temperature has in the past been applied as the temperature surrounding a wiring method (i.e., room temperature, air temperature, etc. ), and not within the wiring method. Since this is a new requirement, let’s explore how it is applied in the field. As contractors and inspectors, we need a clear understanding of how this language is utilized in our daily work. First of all, any installation run on the outside of a building is subject to the correction factors as noted on the bottom of each ampacity table in Article 310, such as Table 310.16. These factors are based on the temperature rating of the conductors used and the ambient temperature. With the new requirements in NEC-2008 310.10(B)(2)(c), we must now add an additional temperature rating to the ambient temperature. 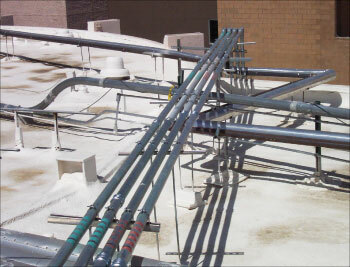 The adder is dependent on the proximity of the conduit to the rooftop. 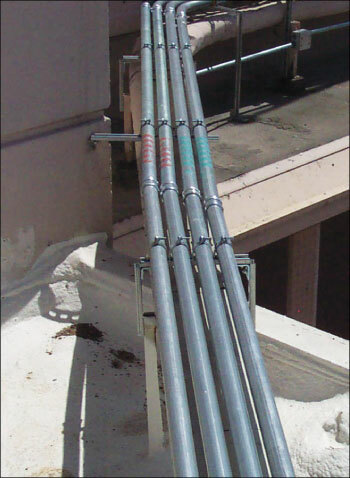 If the conduit installation is within 36” of the rooftop, Table 310.15(B)(2)(c) requires a certain number of degrees be added to the ambient temperature. To illustrate this, I will use the conditions with which I am most familiar, the Southwest desert community of Las Vegas. In Las Vegas, we have at least two months where the temperature commonly reaches over 100°F on a daily basis. According to ASHRAE, the 2% design temperature for Las Vegas, NV is 107°F, which corresponds to the 105–113°F correction factor range under Table 310.16. If a conduit is run across a roof and is installed directly on the roof, the new code language requires that we add 60°F to the ambient, which gives us a corrected ambient temperature of 167°F. If we install this conduit on one of the commonly used support systems and the conduit is between ½” to 3 ½” above the surface, then the temperature adder is 40°F, which equates to 147°F. Using the temperature rating of the chosen conductor insulation, we can now find the multiplier for ampacity correction purposes. If the conductor falls under the 75°C column, the correction factor for ½” to 3 ½” above the roof is .33 or 33%. In other words, we would effectively need to triple the size of the conductor. Most of us are using conductors rated at 90°C, which gives us a correction factor of .41 for flat on the roof and .58 for ½” to 3 ½” above the surface, roughly doubling the conductor size. Please refer to the examples above for actual applications. When dealing with 14 AWG through 10 AWG branch circuits (taken from the 90°C column), you generally do not have to upsize the conductor based just on ambient temperature correction. This is because we start the correction from the 90°C ampacity, adjust the ampacity from there, and then round up the result since it is less than 800 amps (240.4). This usually results in the same wire size because of the overcurrent protection limitation on these sizes. 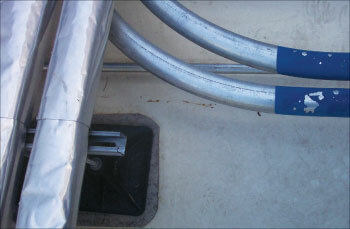 For larger size conductors, the impact can be substantial. Generally, due to the equipment termination limitation of 75°C, when we apply the ambient temperature correction factor for the 105°–113°F desert environment, the conductor size does not change. For example, start at the 90°C column, apply an 87% adjustment, and usually the same size conductor works because the ampacity of the conductor is limited to the value in the 75°C column by the termination limitation. However, when we add in the additional rooftop correction factor, the change can be significant. If we have a 225-amp sub-panel being installed, we would normally run 4/0 THHN/THWN-2 copper. Once you apply the 87% correction factor just for ambient temperature correction, the 4/0 is still adequate; however, when we add the additional 40°F for an installation ½” to 3 ½” above the roof, we are now required to run 400 kcmil. To calculate, start with 380 amps X 58%, which equals 220.4 amps; and the Code allows us to round up for the 225-amp breaker. Also, the conduit size would change from 2 ½” to 3” RMC. When we start to work with equipment over the 800-amp range, we can no longer round up if the ampacity figures are below the overcurrent protection device rating. For example, take a 1600-amp feed which would normally be 4 runs of 600-kcmil XHHW-2 copper. When we apply the 58% deration of the conditions in the desert (105°–113°F ambient temperature plus 40°F rooftop adder), the new conductor size for 4 runs now goes to 1500 kcmil (705 amps X .58 = 408.9 amps X 4 = 1635.6 amps). The conduit size goes from 3 ½” to 6″ RMC. If by some chance you must run this using an insulation with 75°C rating in a wet location, such as THW, THWN or RHW conductors, the correction factor becomes 33%, which will result in 8 runs of 1500 kcmil copper (625 amps X .33 = 206.25 amps X 8 = 1650 amps). Additional comparison data is included in Table 1. Please note that each of the conduit calculations included the properly sized grounding conductor, and when we upsize the ungrounded conductors we must proportionally upsize the grounding conductor. Also, we didn’t apply any other correction factors that may be required due to more than three current-carrying conductors in a raceway, or any voltage-drop calculations. In the Southwest U. S., it is quite common to have wiring installations across roofs. They may be feeding decorative lighting, signage, security lighting systems, or an additional sub-panel added for new equipment at an existing location. We have several medical facilities that seem to be in a constant state of renovation, adding wings and towers which require major feeders being routed across rooftops. 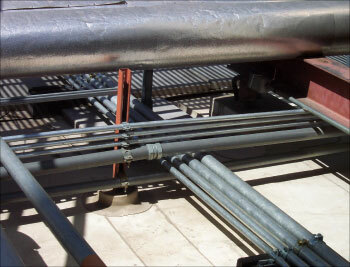 Engineering firms will generally apply the ambient temperature corrections when they are aware that the design requires the systems to be run on the exterior; however, the engineers frequently don’t know the installation path of the conduit, so they simply put it on the drawings and size it using normal ampacity tables. It is at this point that it becomes a field issue for the inspector and the contractor. Now that we have a better understanding of how this code affects us in the field, let’s look more closely at the research that generated this new code requirement. One of the industry trade organizations started a research project in the Las Vegas area. They constructed rooftop simulation models of various materials and surfaces. They made several different installation examples and proceeded to test them. This testing has gone on for several years and a lot of data has been compiled and analyzed. This material has been presented to Code-Making Panel 6 to support proposals for the 2005, 2008 and again in the 2011 Code update process. In the 2005 edition, the information was used to formulate a fine print note. The organization was asked by the code-making panel members to produce more data to better substantiate their claims. In the 2008 cycle, they came back and presented more data, which the code panel reviewed. The outcome was the language we now have in 2008. There are some things to note regarding the language as written. The panel has been careful not to apply the information to any type of wiring method that wasn’t specifically analyzed. One of the results of the panel’s careful approach is that the rooftop temperature requirements apply only to conduits. 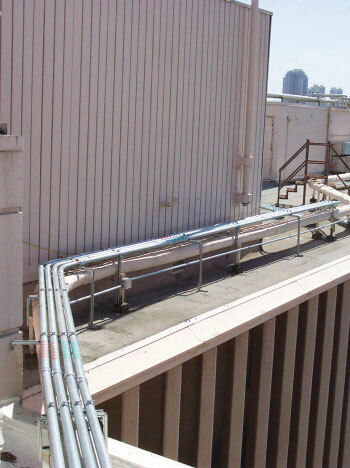 EMT is tubing rather than conduit; therefore, the rooftop requirements do not apply by the literal interpretation. Various other wiring methods which may be installed on rooftops also do not have this requirement. To truly understand the issues here we need to understand that we are actually testing the ability of the insulation to stand up to the heat it is exposed to during operation. In order to do this, we have to understand that we have a choice of selecting either 75°C wire or 90°C wire. Please note that the insulation is listed in degrees C. These temperatures equate to 167°F and 194°F. This is the temperature that the conductor may operate at continuously without being damaged. Most conductors installed on rooftops in new installations are rated at 90ºC (194ºF), which is well above the temperatures that have been experienced on rooftops. 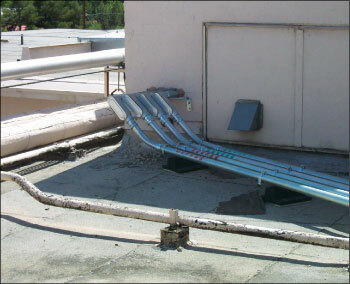 There are several anecdotal stories circulating that have stated that the conductors installed on rooftops have “melted” in the conduits. According to the Insulated Cable Engineers Association, thermoplastic insulation has a maximum short-circuit temperature of 150°C (302°F) and thermoset wire has a maximum short-circuit temperature of 250°C (482°F). These are the temperatures the conductors can reach under short-circuit conditions with little or no damage to the insulation. It is extremely unlikely that a conductor could reach a temperature that would cause the insulation to melt, unless it experienced some type of physical damage that would result in a fault-current situation. It is also possible that the stories are related to the fact that someone couldn’t remove conductors from a raceway due to the solidification of the pulling compounds used, which basically would have glued the conductors in place. To date, I haven’t seen a failure of a conductor installed on a rooftop that was caused solely due to elevated ambient temperature. I have checked among my colleagues in the desert southwest, and have found no one who has witnessed rooftop conductor failure due to ambient temperatures. To sum this up, we now have additional calculations for conduit installations exposed to sunlight on rooftops. These new requirements will certainly have an impact on the size of the conductors and conduits used. The new requirements are likely to add expense to projects. Contractors will now have to consider alternate routing for certain systems and how to properly terminate the additional conductors or the larger conductors, which may not fit the lug sizes of the equipment they are installing. Inspectors will have to enforce this code requirement and catch inconsistencies between the installed conductor sizes and those required by the new rules. Hopefully, these inconsistencies will be caught long before the installation is completed, although this rarely seems to be the case. 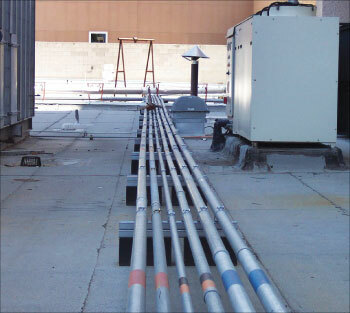 I would challenge inspection personnel to be more proactive and inform the engineering professionals and the contractors about these new requirements when installing conductors in conduit on rooftops. Previous articleWhat types of emergency lighting are listed by UL under the product category Emergency Lighting and Power Equipment (FTBR)?